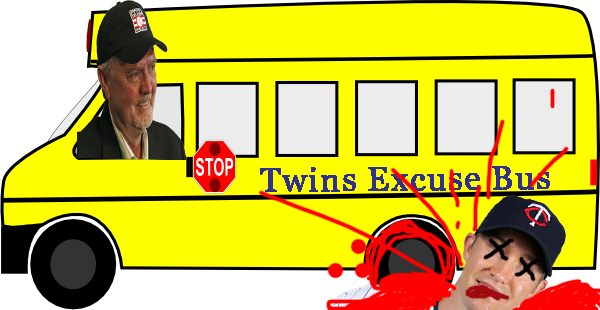 Bert Throws Scott Baker Under the Bus | That's Twins Baseball. A Minnesota Twins Blog. You are here by run over by a rubber circle. UNDER A BLOODY BUS — Saturday was supposed to be filled with joy for those awaiting the rapture. Unfortunately for the followers who thought the rapture was coming, God was too busy. Unfortunately for Twins fans, that meant they had to play baseball against the Diamondbacks. The starting pitcher was Scott Baker, who has been one of the more consistent starters for the Twins during this rapture-needing season. While Baker did strike out 7 and gave up 3 earned runs, he was only able to last 5 innings because his pitch count. He only threw 109 pitches but as all Twins pitchers in the organization know, spontaneous combustion becomes more likely with every pitch over 100. Thus Baker came out and forced Gardy to go to the bullpen early. Yes, this was the game where Capps (who likes to groove it, groove it) gave up the grand slam to Kelly Johnson and the Twins lost another game late. While almost everybody else in the Twins fandom thought Capps should have gotten a little of the blame (4 earned runs on 4 hits) along with Delmon and Valencia’s defensive head-shakers, Bert had a different idea of who the blame should be on. He chose to blame Scott Baker, the pitcher who left the game 2 innings earlier. Yes it was Scott Baker’s fault that Capps pitched as poorly as he did. It was Scott Baker’s fault that Delmon couldn’t catch a ball against the left field wall or that Valencia misjudged a pop-up bunt that went over his head (which I can’t blame him given the fact you are charging in). I don’t have the exact Bert quotes here but he basically attributed the bullpens implosion on the fact that Baker couldn’t get through that 6th inning and thus the bullpen had extra pressure put on them. I know Bert was a pitcher who liked to throw complete games and I applaud him for that but that’s just not the nature of the beast anymore in baseball. I don’t like it either but Bert’s going to have to acknowledge that someday instead of “wishing he would have stayed in longer” . After all, “You can wish in one hand and crap in the other and see which one gets filled first”, but until baseball and the Twins change their expectations of how deep pitchers go into games, there’s always going to be pitchers who come out of games after the reach 100 pitches. Well, that is unless you’re throwing a no-hitter against the White Sox.